Article: The Fine Asian Food corner in Lovina The Asian food corner of Jalan Binaria is hidden in a small side street just off Jalan Binaria which is the street leading to the Dolphin statue in Kalibukbuk. 1. 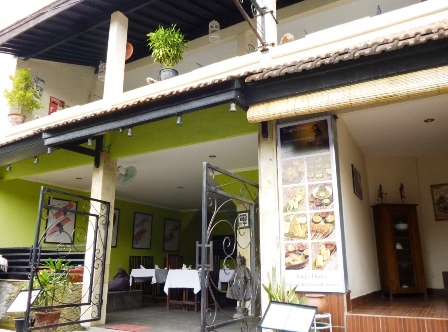 The first Asian kid on the block was Jasmine Kitchen, the very popular Thai Food restaurant which has continued to serve delicious Thai dishes for almost fifteen years. The restaurant was the dream of an English – Indonesian couple. The name Jasmine kitchen referred to the National Flower of Thailand and to kitchens as the best place to meet each other for conversation. Most spices are fresh and home grown; like the gingers, chilies, basil and limes and the plates and dishes were flown in from Thailand to create that real Thai atmosphere. The place is cozy and has a real good coffee corner with Illy coffee and fresh cakes. They have a quirky system on the menu where you can decide how spicy you want your food by the number of red elephants. 2. Next door to Jasmine kitchen is the ever so popular Seyu, Japanese restaurant which opened its doors five years ago. It has a nice, modern interior with a comfortable corner with cushions on the floor, fast Wifi and good music. The staff is friendly and all sushi is prepared fresh in the spacious clean open kitchen. The sushi ingredients are always fresh and the sushi is of excellent quality. Absolutely to die for are the crunchies and Californian rolls. Good miso soup and fresh seaweed salad. 3. Last but not least, upstairs from the Seyu restaurant is the latest addition to Lovina’s specialty Asian restaurants; Tempo Doloe. Tempo Doeloe serves, authentic Indonesian in a real refined old fashioned way. The varied menu is based on generations old recipes. All Indonesian favorites are on the menu; rendang, rawon, sup ikan and gado-gado. A real special Tempo Doeloe treat is ‘rijstafel’ an Old Dutch colonial way of family dining. A whole assortment of Indonesian specialty dishes is served at your table; sate ayam, daging sapi bumbubali, tuna kare, lumpia, tumis tauge, sambal goring bontjis, acar, Serundeng, tempe manis, kerupuk nasi putih and for desert a delicious pisang goreng. Rijstafel is a great way to dine with family and friends, with all the small dishes to pick from. A ‘not to miss’. The good thing is that you can also order from the Seyu restaurant downstairs since it is the same owner. Or order from upstairs when you sit downstairs of course. The three restaurants are really something of a special quality in the area and a good choice for a nice evening out or a lunch date. Parking is no problem since there is ample parking space at the Dolphin statue parking area which is a three minute walk.